This was one busy weekend. There were First Communions busting out ALL over. Young ladies dressed in white, wearing veils or flower crowns. Young men snazzily dressed in their finest suits or sports coats, hair slicked back and their best smile ready to go. I love it. It’s one of my favorite weekends. In our parish it’s always the second weekend in May, Mother’s Day. 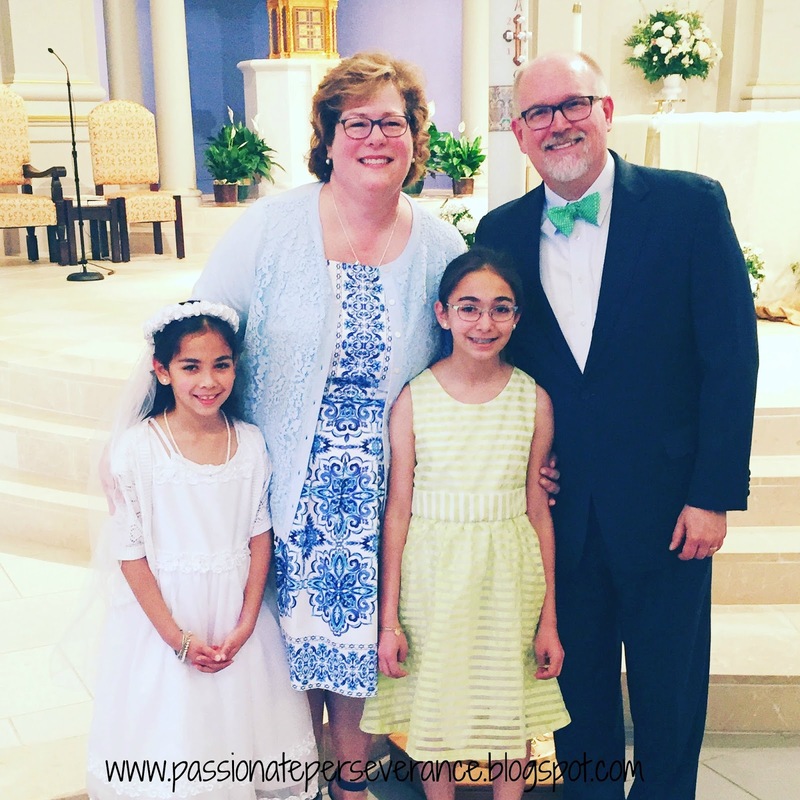 This year I got to witness not one but two First Communions. Saturday, Jerry and I spent the day with my younger brother Dave and his family. My niece Maya, who also happens to be my Goddaughter, was making her First Communion. She was so excited, it was so sweet. I wanted to find a yellow dress, since it’s one of her favorite colors. I had a gift card to Talbot’s and everything was 30%-40% off. While I didn’t find a yellow dress I liked, I did find this sweet number that has many different shades of my favorite color blue. I am really happy with it. It fits like a dream and I love the medallion design. I paired it with an old sweater from Lands End that has a lace lined front. Shoes are from INC, Macy’s home brand. Navy w/ankle straps. My niece Maya had her own shoe game going on. The biggest surprise was that I bought the dress in a whole size SMALLER than I have in TWO DECADES!! It was a 16W. I am stunned. Stunned I tell you. I may have done a little happy dance in the dressing room. There may or may not have been actual squealing. You would have to ask my BFF Christine who was with me. It was nice to celebrate with her and her daughter Tori. I haven’t really done anything other than portion control, walking everyday and drinking a ton of water. I decided last year that I was tired of the up and down of my weight. I finally put it in perspective, slow and steady, consistent and calm is the way to take off 22 years of eating my emotions. 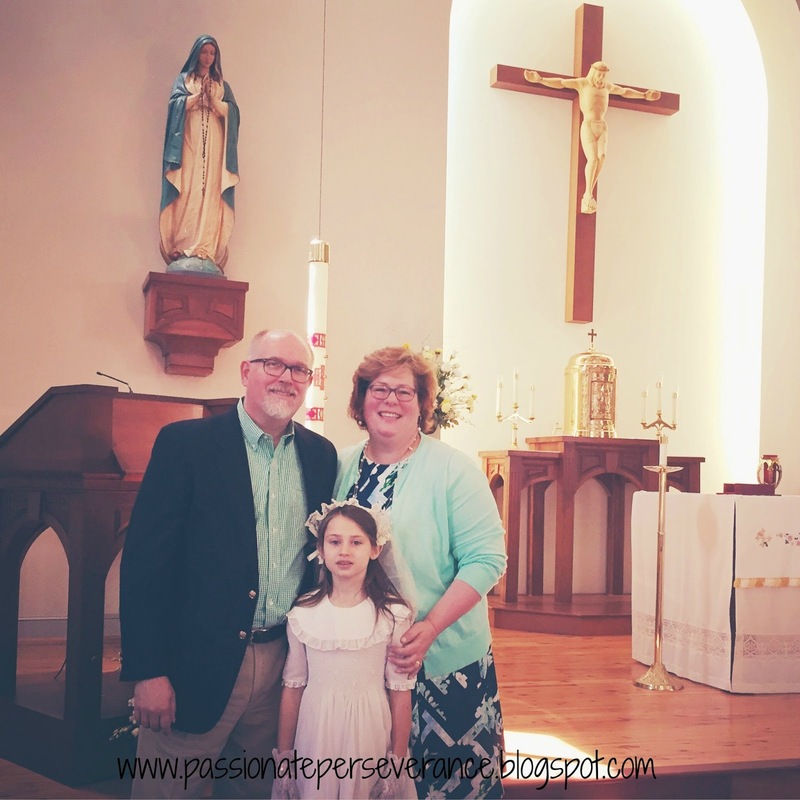 On Sunday we headed out west and celebrated the second First Communion of the weekend with our sweet Goddaughter Lillian V. What a treasure she is to us. We were so blessed to spend the day with our friends Vic and Caroline out on their farm in Lovettesville, VA. What beautiful country. 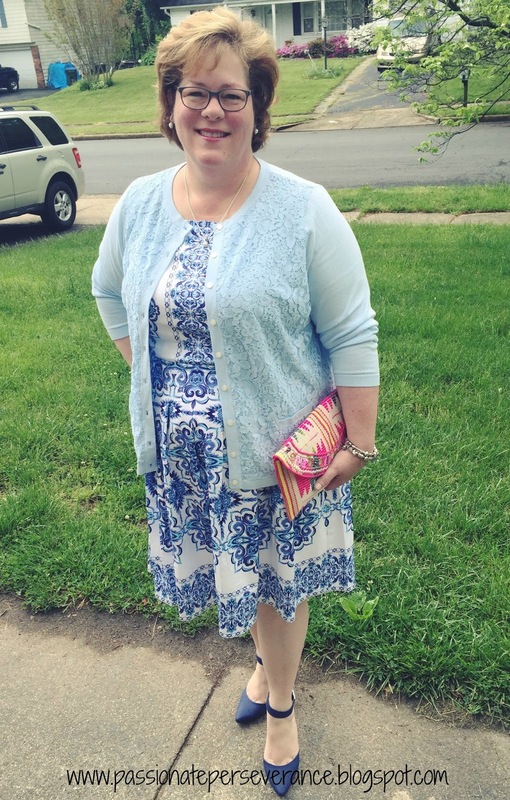 I wore a Calvin Kline scuba dress (from my closet) in navy with a graphic design of flowers in white, shades of blue and mint green. 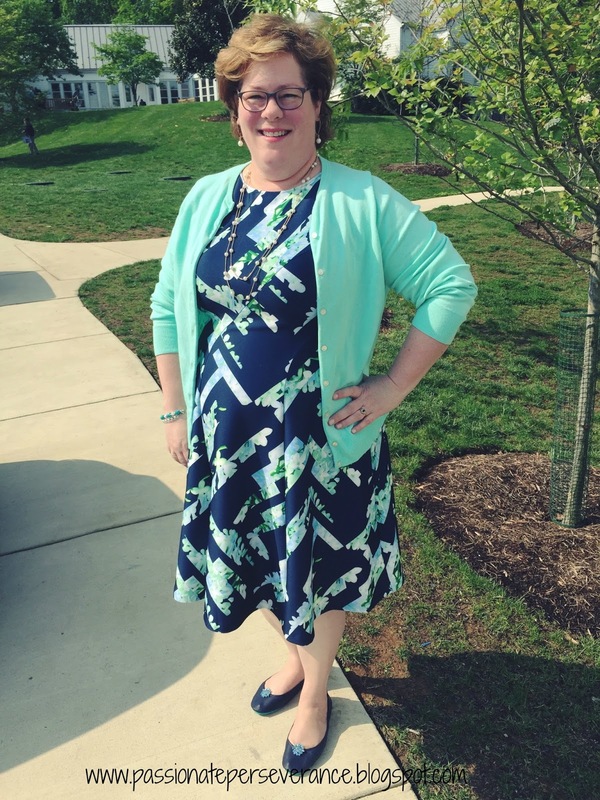 Since it was sleeveless, I paired it with a cardigan in mint green. It worked well I think. So there you have it. My weekend wardrobe. 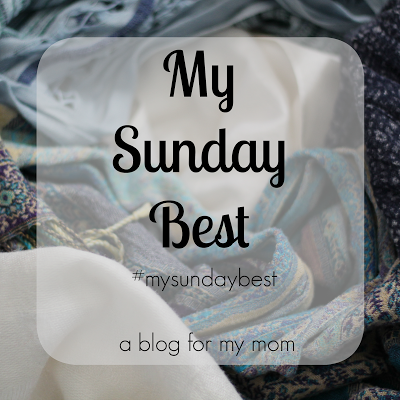 Head on over to A Blog for My Mom and share your Sunday Best with Rosie and the rest of us. Gorgeous outfits, Mary! I'm dying over the print of that blue and white one. And what a special weekend to see your Goddaughters make their first communions! Your dress game is KILLING IT, lady. Oh wow, such detail! A very satisfying fashion post. I've been trying to get some weight off too by drinking only water and not drinking my calories, but Coca Cola is totally my vice. Slow and steady sounds very manageable. I love BOTH your First Communion Mass outfits so much! Not only do they apparently fit like a dream, but they look like a dream. The blue is so Marian and just perfect for the month of May!! And I adore mint anything, so if you've added mint to an outfit, I'm sure to be a huge fan. You look radiant, Mary! Very pretty I LOVE those shoes. 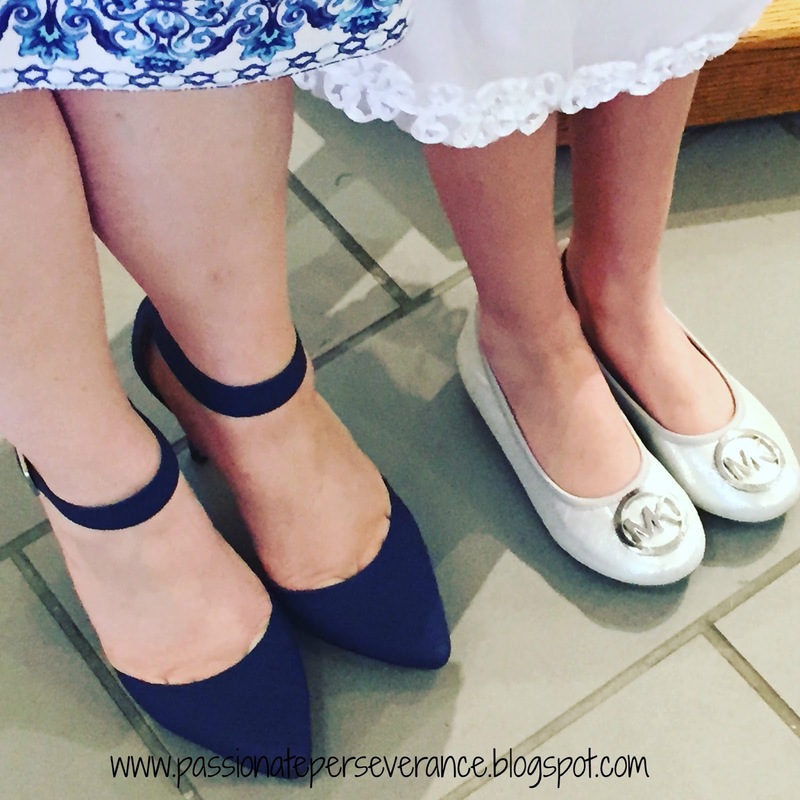 Stopping by from My Sunday Best Link up. We invest critical energy in astounding young women dresses, for instance, first communion dress, expo dresses, first association, and some more. We offer individual insightfulness with respect to each young women dress and can change anything to your specific needs whether size or shading. In the event that it's not all that much inconvenience grant 6-8 weeks to get the solicitations when sent to US and Canada. If you require the solicitation to be passed on sooner please contact us.